The Zohrab Information Center announces a wide-ranging and captivating schedule of educational programs for the Autumn season. Armenian and non-Armenian scholars and artists will present programs on Armenian architecture and liturgy, literature, film, poetry and the anticipated canonization of the martyrs of the Genocide by the Armenian Church. The first program on Wednesday evening, September 10, will be the screening of the film Garod (Yearning) by the award-winning Armenian filmmaker Frunze Dovlatyan. The movie will be presented in Armenian with English subtitles and will be introduced by writer, translator and filmmaker Christopher Atamian, who will also lead a discussion following the movie. 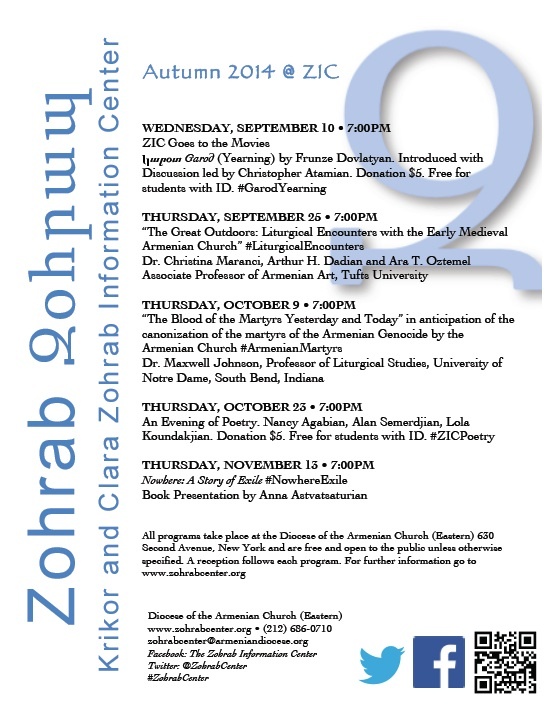 CLICK HERE TO DOWNLOAD THE ZOHRAB CENTER’S SCHEDULE OF EVENTS. All ZIC events take place at the Armenian Diocese, 630 Second Avenue, New York, and are open to the public. 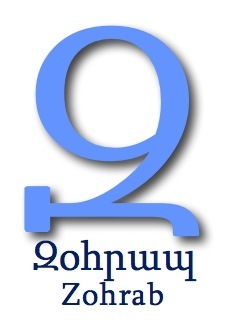 Most presentations will be video-recorded and posted on this website within a day or two of the date of presentation. Follow us as well on Facebook, Twitter and Instagram.